Haus of beauty: Beauty basics: makeup brushes! To achieve the look you desire, you need the right tools. (brushes) from sponges to eyelash curlers - all a key part of your makeup routine and will help you to achieve the look you desire. Investing in a good quality, basic set of brushes is something you will need to achieve your look, make your application easier and the tools themselves will last longer. A flat brush is used to apply eyeshadow to the lid. Use a flat brush by patting eyeshadow all over your lid. I like bigger ones because I have more bigger eyes and more lid space, and I also like stiff ones because they pick up more eyeshadow. Use a smaller flat brush if your have less lid space and smaller eyes. A domed shaped crease brush is for a applying eyeshadow to your crease and is also perfect for creating a more smokey eye. You can also get a soft dome shaped brush that is designed for blending, which is a softer more bigger brush, though you can get thinner/smaller ones Especially if your concentrating colour in a certain area. This is used to smudge eyeliner or apply eyeshadow to your top or bottom lash line. Used to brush and neaten eyebrows and to comb mascara clumps out of eyelashes. 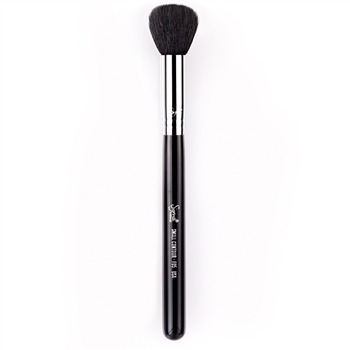 foundation brush:A flat brush that has soft bristles that are held tightly together to apply and blend foundation. Is used to apply powder all over the face. It can be used to apply blush or bronzer also. Used to stipple foundation on your face creating a more flawless, airbrush finish. This brush is used to apply a darker powder (like bronzer) under your cheek bones and other places of your face to contour your face, making your check bones stand out and your face to appear slimmer. I like to contour to mainly make my face appear slimmer in certain areas and it also give my face a more tanned look cause I have really pale skin. Used to apply blush to your cheeks by applying it on the apples of your cheeks and sweeping up to the top part of your ear. This brush is not necessary but I like to use it to apply blush and to contour my face. But I recommend this to makeup artists. This is used to apply lipstick to your lips to create a more precise easier application. This is def recommend to makeup artists. These are optional but if your doing someone's makeup you will need these, You do not want to double dip and spread germs... it's just very un-hygienic! You could use a lip brush and spot clean it after every application but when using lipgloss it's a little harder to get out of the tube. So that's why you need lip gloss applicators/disposable lip brushes for lip gloss. This stuff i recommend to anyone especially makeup artists. This scissor-like tool has rubber pads that press on the lashes giving them extra lift and curl. they are used for upper lashes and can be used before and after mascara application. These are metal and angled and the end, used to remove unwanted hairs. These come in many shapes and sizes, wedge ones are the best to apply and blend foundation and to get around the area's like your nose and eyes. Used to press on face powder to give a smooth finish and keep foundation in place. disposable pads and balls, Used to remove makeup and apply toner and loose powder. Can be used to dip in makeup remover to fix up any makeup mistakes. pencil sharpeners:Make sure to get one specially designed for lip and eye pencils because a ordinary pencil sharpener will break the soft led in the pencil.